Montana Test.com - Results for: GO-KOT Reviewed! This incredible cot will fold up in seconds and store away in its handy carrying case. 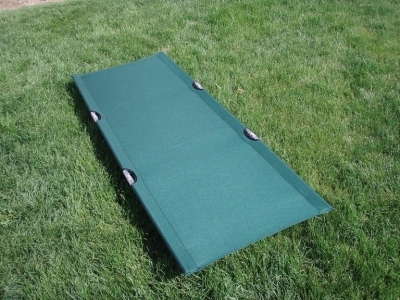 At less than 8 1/2 pounds, take this strong, durable cot anywhere easily -- camping, the beach, hunting, fishing -- or it can be used as an extra bed at home. It is even small enough for backpacking. With its state-of-the-art patented hinges and rugged, heavy bound 1000 Denier Nylon cover, this cot will last a lifetime. Its tough spring steel legs and extra thick wall aluminum can support up to 350 pounds. Setup and take down are a snap. Go-Kot folds for carrying into a package not much larger than a newspaper. Go-Kot's come with a 1000 Denier Nylon carrying case with a snap closure and a separate pocket for the legs - keeping your cot cover clean. When you take the Go-Kot out of the carrying case just unfold it, turn it over so you can see where the six legs fit into the frame. Insert the legs into the holes on the frame. Turn the cot over and you are ready. Notice the design has no cross bars like most cots and this allows for a more comfortable nights rest -- EVEN IF YOU ARE OVER 6'2". GO-KOT is a Lifetime camping cot. Customers, who purchased our GO-KOT in 1978, are still using them today. Truly a product of high quality. 1000 Denier Nylon is tough and resistant to abrasions, tears, scuffs, and punctures, making it great for cots. Nylon is lightweight and water resistant, it dries quickly, and is easy to clean with a damp cloth. Removed the cover and wash. Please click BUY Button at top of this page it will take you to our store for all size GO-KOTS and colors. Please click BUY button at the top of this page. 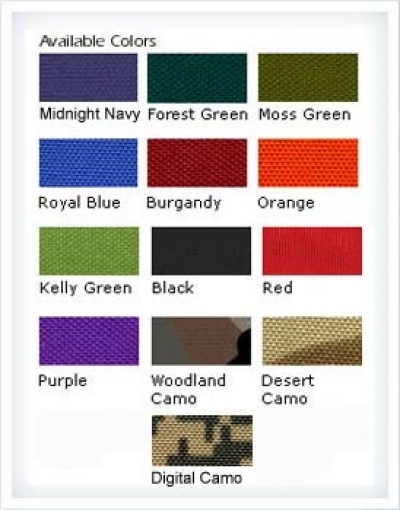 It will take you to our store for all sizes and colors.